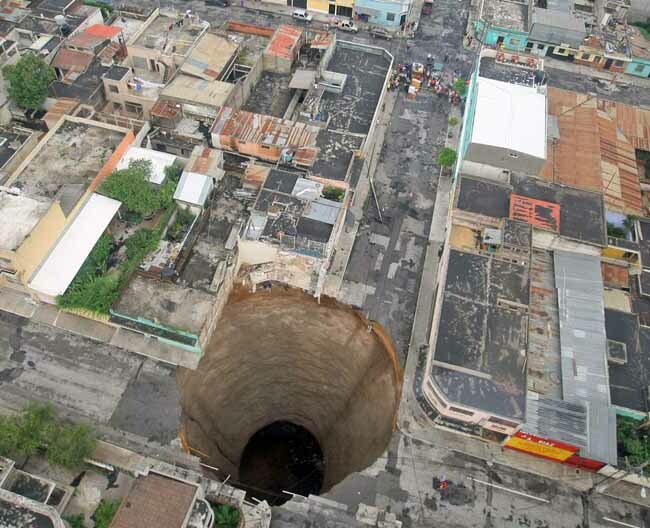 The term itself immediately implies the clinical concept of a psychiatric condition; but, of course, it can also mean that there is a geological sinkhole, of a stretch of land, small or large, sunken in comparison to the surrounding area. A rabbit’s nest can create a depression; excessive rain can loosen the soil and depress the land; and depression can overtake the healthiest among us, sending us down a course which envelopes the emotions, mind and soul with loss of energy, overwhelming sadness, and lethargy of life so overpowering that physical manifestations, profound and intractable fatigue, and an unwavering sense of hopelessness and helplessness pervades. Sometimes, the two distinct but complementary concepts can intersect: the depressed grounds only adds to one’s depression. The former usage, of course, only metaphorically speaks to the physical characteristic of description; the depression of the ground is not literally a physical sinking of the land, but implies a dilapidation of the neighborhood; while the latter refers to the mental state of an individual exacerbated by the solitary degradation of the environment. It is when the two distinct conceptual constructs intersect and are combined, that the impact upon the Federal or Postal worker may be felt. For it is precisely the vicious cycle of “feeding upon itself” that the Federal or Postal Worker experiences — of the depression in a clinical sense, combined with the depressed grounds of one’s workplace — when change of scenery may become necessary in order to travel towards the path of restorative health. Federal Disability Retirement benefits, filed through the U.S. Office of Personnel Management, is available for all Federal and Postal employees who are under FERS or CSRS, when the intersection of a medical condition and one’s inability to perform one or more of the essential elements of one’s job, comes to the fore. It is there to be eligible for all Federal and Postal employees, when the depression (in the clinical sense) impacts the depressed grounds (in the sense of the work environment). Thus, when the joy of life is depleted, and the hallowed grounds of sunlit mornings and the cool breeze of dusk transforms into a universe of regret and remorse, Federal Disability Retirement benefits for the Federal and Postal employee should be a serious consideration; as it may become necessary to leave the depressed grounds of yore. Shoes come in pairs; gloves, eye glasses, slippers and shoelaces. Obviously, products are manufactured to fit the need, and the loss of one of the pairs often requires the purchase of replacement for both, precisely because it is difficult to locate a store which will sell you only one of the replacement pairings. Other couplings may not be as easily identifiable, but nevertheless tend to be related; for example, “stress” if often paired with “anxiety“, and a hostile work environment is tied to both stress and anxiety. Though we may not refer to such related concepts in the manner similar to a pair of gloves (one doesn’t hear the term, “the pair of stress and anxiety”), the combination coincides precisely because of the inherent nature of similitude. So, perhaps the proper and more appropriate conceptual identification involves a somewhat vicious circle of cause-to-effect, effect-to-cause? Whatever the technically precise categorization of conceptual identification, for the Federal or Postal employee who suffers from a medical condition, such that the medical condition prevents one from performing one or more of the essential elements of one’s positional duties, one thing is clear: all such concepts are interrelated, connected, intersecting in conceptual constructs, and compounded in complexities of human behavior. The pairing of conceptual constructs is a reality in the world which is not mere linguistic play; the medical condition is real; the world of work is often harsh; stress is a silent but true killer; and anxiety is not just a passing phase in one’s life. No, it is not the pairings which are unnatural; rather, it is artificial nature of how we cover up the reality of such pairings, which makes for sadness in this world. Various social commentators have observed the contradiction that, while we live in an increasingly global economy, individuals feel a greater sense of isolation; thus, the conundrum that the world is no longer an expansive, unreachable universe, but in private lives, the uniqueness of the individual is lost and forgotten. Whether because of the stresses of isolation, or because of the fast-paced, technologically-driven world in which we live, or some organic-based reasons, one may never know; nevertheless, the exponential explosion of psychiatric illnesses erupting in our society cannot be denied. There was a time, perhaps a decade or so ago, when a stigma was attached to medical conditions and disabilities which were deemed “stress-related“, and which encompassed depression, anxiety, uncontrollable panic attacks, agoraphobia, etc. One cannot mark a clear demarcation of when the approach and societal attitude, let alone the medical community’s acceptance, of the wide array of psychiatric conditions, changed. For Federal Disability Retirement purposes, however, the level of approvals versus denials between cases involving psychiatric conditions, as opposed to purely physical medical conditions, has become indistinguishable. The U.S. Office of Personnel Management does not review or analyze cases based upon psychiatric conditions — so long as one can tell, purely from an “outsider’s” perspective — any differently from “physical” medical conditions. This is obviously a “good” thing, because psychiatric medical conditions are just as valid, serious, “real”, and devastating, as the most serious of “physical” medical conditions. The world in which we live has certainly changed; OPM has evolved with the new world, and we are all the better off for it. In preparing, formulating and filing a successful Federal Disability Retirement application with the Office of Personnel Management, under FERS or CSRS, the issue of accommodations will come up. The Agency from which one retires under a Medical Disability Retirement will have to ultimately fill out Standard Form 3112D — Agency Certification of Reassignment and Accommodation Efforts — which will constitute and satisfy the Agency’s attempts at “accommodating” a Federal or Postal worker in his or her current position, taking into account his or her medical conditions. Unfortunately, most medical conditions are deemed to be “non-accommodatable” (if such a term exists in the English Language), and this is logically as well as legally true because with or without the accommodations, one must be able to perform all of the essential elements of one’s positional description. Minor adjustments to the workplace, or even to the work assignments, may be able to allow for the Federal or Postal worker to continue to work in a Federal or Postal position for some time, but that Federal or Postal worker must be able to perform all of the essential elements of the job, as described in the position description. An Agency may temporarily suspend certain elements of the core functions of the job, but such temporary suspension does not constitute an accommodation under the law. For psychiatric medical conditions, it is rare that an Agency will be able to accommodate such a medical condition, precisely because of the inherent nature of the medical condition — that which impacts upon one’s focus, attention, concentration, and ability to organize and perform executive functions in a coherent and systematic manner. As such, the issue of accommodation, while one which may have to be addressed in preparing, formulating and filing a Federal Disability Retirement application, is normally an irrelevant, non-issue. It may seem antithetical to talk about the psychiatric condition of Generalized Anxiety Disorder in filing for Federal Disability Retirements benefit under FERS or CSRS, especially during the Holidays — but, in fact, the analogy with the high stress which many Federal and Postal workers feel because of Christmas, New Years & other holidays is especially relevant. Let me elaborate. Such a time period as “The Holidays” in fact often brings greater stresses in a person’s life — for it is precisely a time when one is “supposed” to feel joyous, when in fact an individual’s internal, personal turmoil may contradict the outward appearance which one manifests. Such a combination — of the high level of stress one is experiencing, at a particular time (the Holidays), may be considered a “situational” psychiatric condition, because (hopefully) it will subside once the time-period passes. This is a good way to understand what distinguishes between a “situational disability” (which is disallowed in Federal Disability Retirement applications under either FERS or CSRS) and “non-situational disabilities” (which are viable medical conditions pervading all aspects of one’s life, regardless of time or situation). The Office of Personnel Management will often attempt to characterize the psychiatric condition of Generalize Anxiety Disorder as one of merely “situational occurrence” — i.e., of being particularized and categorized as occurring only within the confines of a particular department, a particular workplace situation, or a period of time when a specific supervisor or coworker is present (sort of like occurring during the Holidays). But Generalized Anxiety Disorder, properly diagnosed by a treating physician, is rarely, if ever, situational, and in fact is a serious psychiatric condition which qualifies for Federal Disability Retirement benefits under FERS or CSRS. Do not let the Office of Personnel Management fool you; Generalized Anxiety Disorder is a viable psychiatric medical condition, especially if it pervades all aspects of your life, and it prevents you from performing one or more of the essential elements of your job as a Federal or Postal employee under either FERS or CSRS.